The system above shows a cylinder with a small diameter (Gutter) connected to a cylinder with a larger diameter (Barrel). 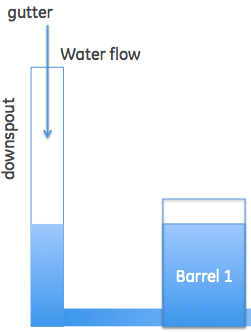 The force due to gravity by the liquid in the small cylinder is less than the force due to gravity by the liquid in the larger cylinder, since there's much more liquid in the larger cylinder. Shouldn't this make the liquid in the small cylinder rise, until the forces equal each other out? In reality, no. The fluids in a system always like being at the same height. This made absolutely no sense to me until I decided to look it up, and found out that it actually isn't that complicated, and I should feel ashamed. The reason that the fluids are at the same height isn't because they apply the same force, it's because they apply the same pressure. And since pressure is equal to force divided by area, it makes sense that in order to have a small amount of liquid be at the same height in a system with a larger amount of liquid, it would need to be put in a container with a smaller cross-sectional area. Alternatively, it could be put at a different elevation, but that's just cheating.